Interview conducted by Lori Calabrese of Lori Calabrese Writes! Nicole Tadgell has illustrated several picture books for trade and educational publishers, including the Américas Award–winning Josias, Hold the Book. Nicole Tadgell was born in Detroit, Michigan. Her family moved frequently, living in Michigan, Texas, New York and Massachusetts. In Texas, when it was too hot to play outside, she and her older sister would spend hours playing with dolls, reading, and their favorite activity, drawing. Frequent moves only increased her natural shyness, especially because she was sometimes the only African American in the class or even the whole grade. Feeling different drew Nicole further into her own created worlds on paper. Art was both fun and an escape. While at Wheaton College in Norton, Massachusetts, Nicole studied studio art and education, hoping to become an art teacher. But she recalled how much fun it was to draw her own stories, and concluded that illustrating children's books could be the right path. Today, Nicole has fourteen books and numerous educational pieces published. Her expressive watercolors depict lively children, fantasy, and nature. In addition to illustrating children's books, Nicole is a graphic artist for an advertising agency in Worcester, MA, where she has illustrated many pieces of collateral, ads, annual reports, and other marketing-related documents. Tell us about your path to illustrating children's books. I've always loved picture books. I treasured the ones I had when I was little, and when I outgrew them, I tucked them away carefully. I got into comics for awhile (specifically the ElfQuest graphic novels). When I took a children's literature class in college and was assigned to analyze and compare illustrations in two different copies of Snow White, I got hooked again. I was always an artist and loved to draw. When I took this class, it occurred to me that illustration could be just what I was suited for. So after college I worked on my portfolio, did some small freelance jobs in addition to my day job, and came across SCBWI. My first conference was in 1999, on my 30th birthday! I had a portfolio review with Cate Monroe and months later was offered to illustrate Fatuma's New Cloth. Tell us about your medium and give us an idea about your workspace. I use watercolor and pencil on watercolor paper. I like to scan my final drawings and bring them into Photoshop. Then I print them onto watercolor paper using my Epson 2200. It works out great this way, because if I make a mistake painting, I can just reprint the drawing and start again. 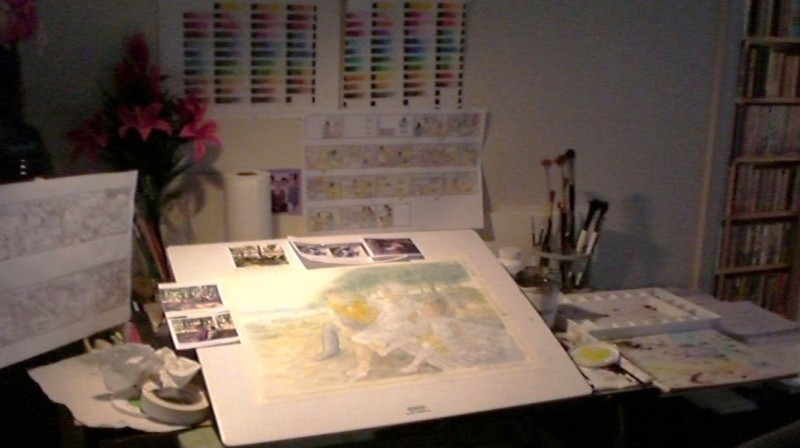 My workspace is pretty much a drafting table with individual boards angled for a painting & drawing surface. I use Winsor Newton watercolors and Fabriano Uno paper - the bright white kind. I've gone through a trial and error process of choosing which colors I both like, and reproduce well. The new scanner I have has really helped this as well, as I can scan in painted color charts (you can see them taped to the wall in the Table-Area photo below) and convert them to CMYK and see what happens. Some colors just don't work. I was disappointed at having to give up some of my favorite colors, but I've found replacement ones, thanks to the help of artist friends! I use masking fluid when I want to work on big areas and protect smaller ones. [I peel] back the mask after the paint has dried. Congrats on your new book, No Mush Today. Give us an idea of how long it took to complete the entire picture book. Thanks! It took about a year. I like to work in three stages. The first stage is storyboarding and character development, breaking the text and deciding how to move the story along. This is so fun— anything can happen! The second stage is tight pencils, research, models, accurate drawing. It's much harder. The last stage is doing color tests, and finally, painting. Each stage ideally takes about three months, but if I get extensive revisions or if I run into a problem that takes longer to find a solution, it can stretch out a bit longer. What were some of the challenges of bringing this story to life? The first one was about using models. When I read the manuscript, I immediately thought of my friend's daughter. Maggie was an adorable four year old (possibly going on five), bright, outgoing, and tall for her age. I drew my storyboards and rough pencils with her in them. When I showed them to the publisher, they wanted the main character to be six. What to do? So I found another child who was six, but she seemed much more mature for her age. So I sort of combined traits from both children to create the character of Nonie, and I'm pleased with the result! Which project of yours has been the most challenging and why? This one! Probably because it's the most recent one and is fresh in my memory. If I think about it, possibly the four book series I did for Judson Press. That was very difficult. You've said that it wasn't until after college you realized there was something missing from your childhood— books with kids who looked like you. Do you feel there's a better variety of children's books for African Americans today— why or why not? You're represented by an artist agent. Is that something you recommend to other illustrators— why or why not? If you like doing all kinds of marketing, if you like (and understand!) contracts, if you enjoy negotiating prices - you'd be great representing yourself! But I'm not very good at those, so I'm partnered with Chris Tugeau and have been with her since 2001. I'm getting better at marketing, though, and I read my contracts and feel like I'm getting better and understanding all that legalese. For new artists wanting to get into the business - I know they may not want to hear this, but: take your time. Be choosy about your first book, because it's your "debut". There are awards and honors out there that don't apply if you've done too much, too fast. I would also highly recommend making a "pen name". That way you can keep your private life separate from your public life. This article was reprinted with permission from an interview between Nicole Tadgell and Lori Calabrese for Lori Calabrese Writes! : Jump Into the World of Pictures Books.